This new Administrative Campus Center for the Claremont University Consortium (CUC) consolidates the majority of CUC departments and services, previously dispersed and fragmented across campus, into a single location. The adaptive reuse of an underutilized 42,000-square-foot maintenance building provides CUC with an environmentally sensitive and vibrant work area that has a well-defined public character and creates a collective gathering place for the colleges and the broader community. The project deploys a series of intertwined, materially rich, tactical elements that transform the existing facility and redefine its public presence. 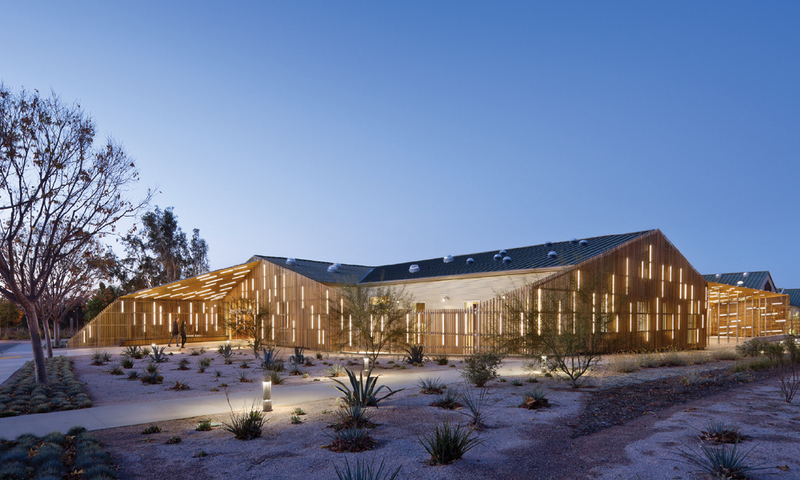 These include a continuous 740 foot long cedar screen, a custom ceiling cloud, a digital garden, and a field of 168 solar chimneys that provide natural light through the space. While a major aspect of the sustainability strategy is retaining and reusing the existing prefabricated steel shed, its current utilitarian exterior is neither inviting nor appropriate for the new use. To redefine the building’s character, a continuous cedar surface wraps portions of its north, east and south elevations. The ribbon works with the original pitch-roofed geometry of the building, but slips free of its shell to produce a clearly defined entry point along with a series of outdoor gathering spaces. Moving from exterior to interior, the cedar screen defines the major public circulation and shared facilities. Illuminated at night with embedded LED lights, the cedar ribbon serves as both a wayfinding device – denoting the building’s entry to vehicular and pedestrian traffic – and as a recognizable image for CUC. The interior exploits both the high ceiling and the large spans of the existing steel structure, providing an open office space with custom furniture for more than one hundred employees. Using Solatube skylights in combination with expanded windows along the perimeter, there is enough natural light to work at all stations without artificial lighting during the day, greatly reducing the building’s energy consumption. To allow the light to filter into the space, a custom ceiling is composed of nearly 1,500 9-foot-long by 8-inch high baffles, which are clad in felt made from recycled plastic bottles. The ceiling unifies the space, forming a sculpted interior cloud across the entire building that obscures the infrastructure, and assists with sound mitigation in the open office. A wide stair emerges from a central spipne of red carpet, providing bleacher-like seating for large gatherings. 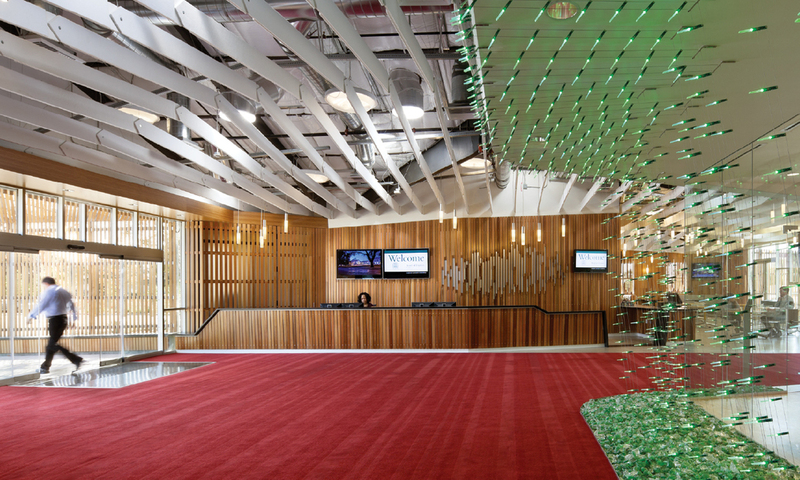 A digital garden installation, comprised of more than six thousand LED modules, envelopes the central core of meeting rooms. The LEDs are triggered by the motion of people walking nearby, and subtlety shift from green to blue back to green. As one moves around the installation the perception of the LEDs as an assemblage also shifts from a crisp line to a surface to a porous thickness. Hawthorne, Christopher. "Screening Room. "Architectural Record. February 2012.